In preparation for the [remastered] reinstallation, Head of St. Joseph by Giovanni Lanfranco (Italian, 1582 – 1647) was successfully treated in the Museum’s conservation department. Prior to treatment, the painting remained in storage for several decades due to its discolored varnish coatings, surface grime, and poorly matched restoration materials, which imparted a dull, flat, and dark appearance lacking in tonal balance and clarity. The goals for treatment were initially minor: removal of surface grime and the uppermost coating, followed by the addition of a saturating varnish and some limited inpainting of visible losses. However, after the surface grime and a waxy coating layer were removed, it became clear that there would be much to be gained aesthetically by removing the yellowed, degraded, and uneven varnish coatings and retouching. Cleaning the painting was revelatory. Once covered in a thick brown-gray veil of accumulated varnish and grime, the subtle violet hues of the saint’s shirt and his ruddy complexion are now apparent. The cleaning also revealed retouching and several small losses that contributed to the painting’s somewhat muddy appearance before treatment. Filling and inpainting these losses helped to improve the overall clarity of the picture. 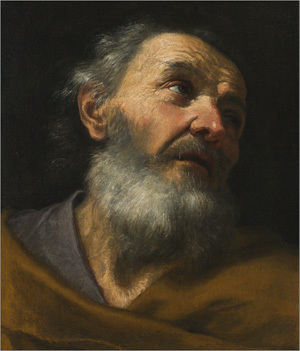 As a result of cleaning, filling and inpainting of losses, and revarnishing, the artist’s skill in rendering the saint in a believable chiaroscuro stands out from across the room while humanizing details emerge upon closer inspection: a slightly tattered drapery fold in the saint’s cloak; veins in his neck and forehead; weathered skin rendered in sculptural impasto; and stray whiskers hanging over the edges of the saint’s mouth. The opportunity to finally bring the painting out of storage for treatment allowed for a complete rediscovery of Head of St. Joseph, and it is now displayed among other great examples of Old Master painting in [remastered].